'Story Of My Teeth' Covers Art, Identity And Dental Adventures Critic Heller McAlpin calls Valeria Luiselli's novel a "philosophical funhouse" that melds the story of a charming auctioneer with meditations on the value of objects and the power of story. Quirky doesn't begin to capture the wacky inventiveness of Valeria Luiselli's second novel. 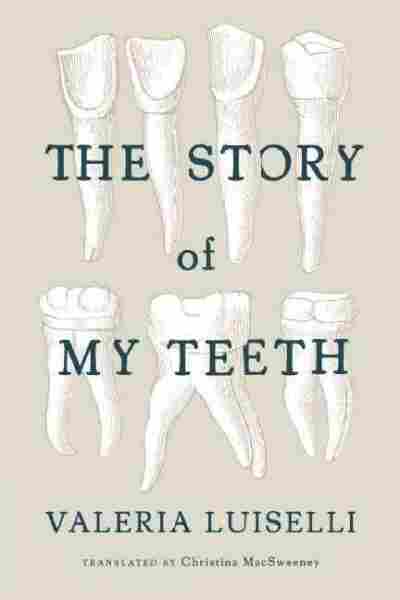 The Story of My Teeth is a playful, philosophical funhouse of a read that demonstrates that not only isn't experimental fiction dead, it needn't be deadly, either. Luiselli's elastic mind comfortably stretches to wrap itself around molars, Montaigne, fortune cookies and various theories of meaning. The result is an unusual "novel-essay" about art, identity and stories that delivers on the intellectual promise of her meditative, elegiac first novel, Faces in the Crowd, and her widely roving book of essays, Sidewalks, while amping up the fun factor. For starters, the book's narrator, Gustavo Sánchez Sánchez, aka Highway, is a charmer. The self-proclaimed "best auctioneer in the world" who "can imitate Janis Joplin after two rums" and "interpret Chinese fortune cookies" announces with typical directness: "This is the story of my teeth, and my treatise on collectibles and the variable value of objects." What is it about writers and teeth? Remember the torturous dental saga in Martin Amis' memoir, Experience? Is it because teeth are necessary for speech — not to mention bite? Luiselli's narrator is a talker. He's also a collector — of everything from his father's nail clippings to his own extracted teeth, "as wide as shovels, each pointing in a different direction." As soon as he can afford it, he replaces them with Marilyn Monroe's purported chompers, bought at auction in Little Havana. Among Luiselli's talents is an ability to combine complexity with clarity and solemnity with hilarity. Highway lays out the narrative arc: "As any other story, this one begins with the Beginning; and then comes the Middle, and then the End. The rest, as a friend of mine always says, is literature: hyperbolics, parabolics, circulars, allegorics, and elliptics." Filtered through Luiselli's brilliant, polymath imagination, there's nothing icky about all those "ics" — various modes of storytelling, each showcased in its own chapter. A bonus sixth "ic" — an elaborate, handy Chronologic timeline constructed by Christina MacSweeney, the book's agile translator — helps keep it all straight. One entry flags the posthumous 1950 publication of Virginia Woolf's essay "Gas," about having several teeth extracted in 1922 and 1923; another marks the 1985 Mexico City earthquake that killed more than 10,000 people and was followed a few minutes later by the birth of Highway's son. More than things, Highway is "a lover and collector of good stories, which is the only honest way of modifying the value of an object." His modus operandi is to inflate an object's worth through hyperbolics — "an elegant surpassing of the truth." In a play-by-play demonstration, Highway auctions off 10 of his old teeth for a church benefit. He assigns each a different provenance from among his intellectual heroes, including Plato, Rousseau, Virginia Woolf and Jorge Luis Borges. The apotheosis of this auctioneering is Highway's "famous allegoric method," a sort of "postcapitalist, radical recycling" in which no objects are sold, just "the stories that give them value and meaning." He hopes this will "save the world from its existential condition as the garbage can of history." Highway is the sort of unreliable narrator who sells himself as much as others on his amplifications. His personal history, although delivered with the effervescence of denture cleaning tablets, isn't an altogether happy one, involving filial as well as dental woes. His estranged son, Siddhartha, is a curator at the Galería Jumex, an actual art gallery funded by the juice company Grupo Jumex, "located in the marginalized, wasteland-like neighborhood of Ecatepec outside Mexico City." This is where Highway long worked as a security guard. Siddhartha, alas, turns out to be more conniving than spiritual. My reviewer's copy of The Story of My Teeth came with a fabulous extra — a separate fact check pamphlet by Coffee House Press intern Aoife Roberts, who verifies all but a few of Luiselli's arcane facts. ("Are the fortune cookies translated correctly? Not sure.") The publisher would do well to post this online. Fortunately, the finished book also includes MacSweeney's Chronologic and a fascinating afterword in which Luiselli explains how the book grew out of a commission to write a work of fiction for the catalog of an exhibition about the connections — or lack thereof — between the juice factory and the art featured at the Galería Jumex. She collaborated back and forth with factory workers to create a novel incorporating their stories, which could be read aloud to reduce the tedium of their jobs — in the tradition of 19th century "tobacco readers" in cigar factories. This story behind The Story of My Teeth adds yet another delectable dimension to an already succulent concoction.